REPAIR is an initiative of the Network for Solidarity, Empowerment and Transformation for All (NewSETA) funded by the National Endowment for Democracy (NED) Washington DC –USA. It is an annual youth peace and democracy series intending to deepen young people’s knowledge about peace and democracy while fostering a culture of active youth participation and leadership. 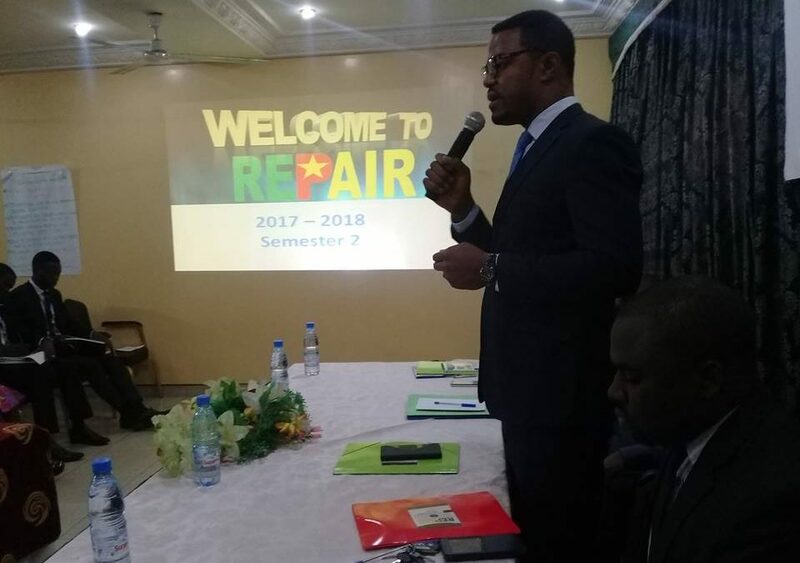 Based on the need to promote young people’s active participation in democratic governance and political structures in Cameroon, the REPAIR series supports young activists and organizers as thought-leaders and allies in crafting solutions and new youth-focused approaches to democracy and its challenges in our society. The 2019 REPAIR series will host 40 youth leaders from the ten (10) regions of Cameroon for two (02)semesters, each lasting for three (03) days during which participants shall exchange and build knowledge, skills, and values needed in advancing democracy work. The REPAIR series is knowledge based and activity-oriented, and this year focuses on fostering understanding of Cameroon’s Democratic process, Electoral monitoring, Youth participation, and Leadership. Each participant will have the opportunity to build his or her leadership and organizational skills by carrying out a step down (Pass-it-on) activity in their place of residence or region of origin, as a means of strengthening knowledge of our democratic values among peers. The semesters will involve discussions on important questions of peace and democracy within society and may lead to policy proposals on same issues to relevant stakeholders. This year, Transparency International Cameroon joins us to implement the series and unpacks the Youth Democracy and Integrity Initiative. Upon the successful completion of the REPAIR series, each participant will be awarded a Certificate as a Youth Envoy for Peace and Democracy (Yep) and will serve as a regional focal point for NewSETA, Transparency International, REPAIR alumni, and lead activities on behalf of the World Youth Movement for Democracy in the regions. Demonstrate strong interest in democratic activism and in the advancement of peace and democracy in their respective communities or nationally. Preferably is a youth leader affiliated with a sector civil society organization. While we will consider applicants who are currently employed by a civil society organization or are graduates, we will request additional information to confirm that the individual is acting on their own in regards to their participation, and that their current employer is flexible with their independent role as a REPAIR attendee. To be eligible to attend the next semester and receive the Certificate, each attendee must (after the first semester) conduct a Pass-it-on (PiO) activity reaching at least 30 youths in their respective regions and submit a report to NewSETA. Certificates are given to individuals only. Please Note: The 2019 REPAIR series is open to applicants from Cameroon only. REPAIR is not an educational program offering academic courses leading toward a degree. It does not provide funds or any other type of financial aid to graduate students, nor is it designed to finance youth projects/organizations. The program cannot support those seeking to complete professional training programs, attend conferences, or pursue internships at other organizations. Interested applicants should download the Application form, fill it as required and send to the following address newseta@yahoo.com, together with a separate curriculum vitae, and One (1) recommendation letter from one of the two referees who should be mentioned on the Application form. Applicants should only mention the required details of the second referee on the Application form without asking them to write a second recommendation letter for the candidate. Please, direct all questions to the same email address provided above. A working knowledge of English and French is an important prerequisite for participation in the REPAIR program for general communication purposes. Some facilitators may prefer to use either of the languages. All application materials must be submitted in English or French. a clear explanation of how the program will benefit their own efforts for advancing democracy. The deadline for application for the 2019 REPAIR series is January 20, 2019. Two to three weeks following the deadline, applicants shall be notified of their status. Selected applicants shall be contacted and provided with further details about the rest of the program of the first semester, to take place in February 2019. Selected candidates shall pay in a one-off registration fee of $30. If for any reason an applicant is unable to attend the program after he/she has been selected, they should please promptly notify NewSETA of this to enable us contact alternate candidates in time.